Today's card was featured at February stamp club, but I forgot to post it here. Silly me! This Beautiful Peacock stamp set is a Level 1 SAB item, meaning you can still get it for free with a $50 or more order through March 31st. 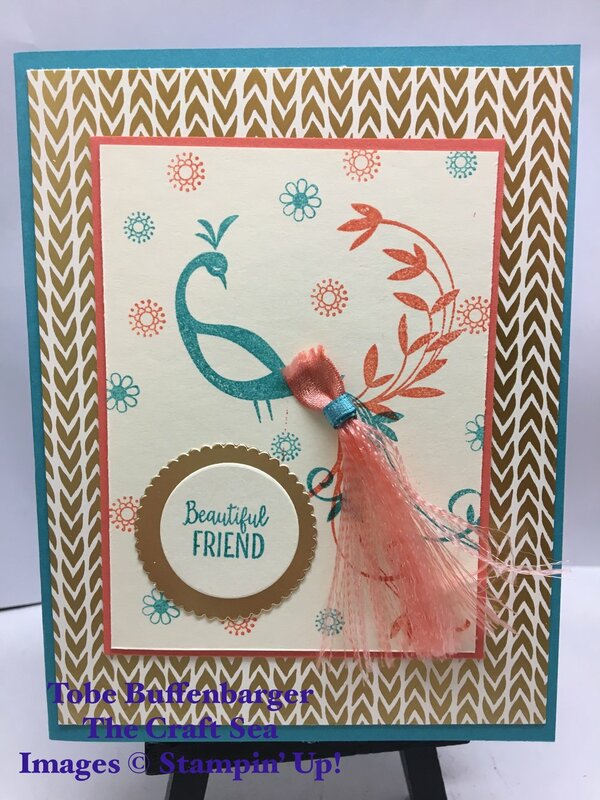 For my card, I stamped the peacock, tail, and little floral bits to fill up my piece of Very Vanilla. After adding on some DSP, a sentiment, and a few layering pieces, I focused on one last flourish. I created a Calypso Coral "tail" by unraveling a piece of Shimmer ribbon to the desired length. I used a small piece of Bermuda Bay ribbon to tie my unraveled piece off and attached to the peacock.